Just two years short of two decades, couturier Varun Bahl — known for fusing Indian handcrafted embroideries with a modern colour sensibility — has forayed into the pret-a-porter market to woo customers who are design conscious but price cautious. “I always wanted to do pret. With pret, you can reach out to a much larger audience and a much larger client base than couture because of the price points. 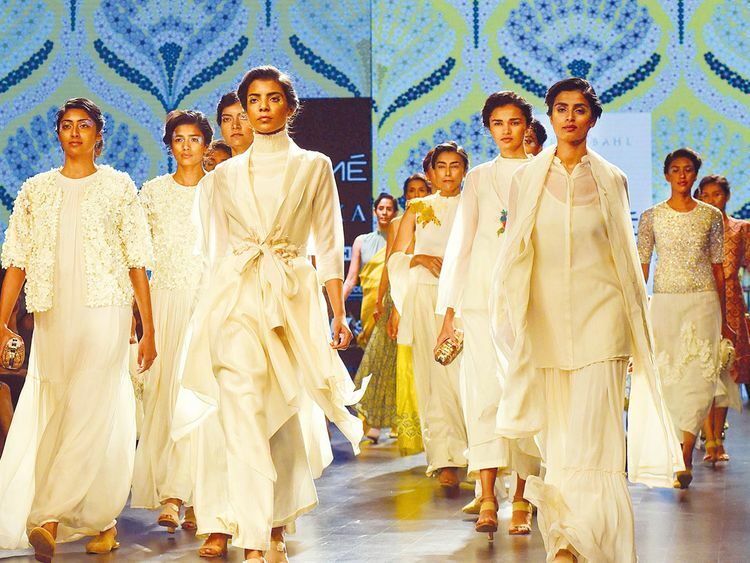 That was the whole idea,” Bahl said after showcasing his maiden ready-to-wear line ‘The Five Petal Story’ at the Lakme Fashion Week (LFW) summer-resort 2019. The show, attended by the likes of Ankita Lokhande, Kubbra Sait and Kim Sharma, marked Bahl’s return to the LFW runway after four years. With unique prints and delicate touches of hand embellishment, the ensembles stuck to Bahl’s signature delicate, floral-inspired embroideries, mostly in vintage pastels with hints of darker shades. “It is contemporary Indian wear. Any person can wear these and it will not look Indian.... Not that there’s anything wrong about it, but it’s not Indian wear tilted towards occasion wear. These pieces can be worn on a daily basis,” said Bahl, adding that they are priced comfortably between Rs5,000 and Rs30,000. Money, he said, can’t necessarily buy the right look for a person. “It’s not that if you will spend a lot of money, you will look nice. A lot of people spend little and look very good. This line is an attempt from me to dress people who spend on more pieces but they have a certain price point that they don’t cross,” Bahl added. As someone who has worked mainly with couture, Bahl says though the wedding market was affected by the demonetisation move of the Indian government in 2016, brides continue to remain willing to spend what they desire to look the best on their D-day. “I have belonged to the couture brigade up until now. After demonetisation, the size of the Indian weddings went down, but it’s the celebration aspect — how lavish is the wedding going to be. “I think the bridal outfit is something no one will sacrifice on. If you want to spend a certain amount on the clothes, you will, and rather cut down corners on other things. Instead of 5,000 people, call maybe 1,000. An Indian bride never sacrifices, and that’s so wonderful,” Bahl said. At present, Bahl’s retail network stretches over 20 outlets, including his three flagship stores - one in Delhi’s DLF Emporio mall, one in Mehrauli, and the recently launched outlet at Kala Ghoda in Mumbai.